Until recently, NFL teams and fans alike weren’t sure if there’d even be a football season. But with the lockout finished, football is back, so the Arizona Cardinals organization had to scramble to order casters for their University of Phoenix Stadium. 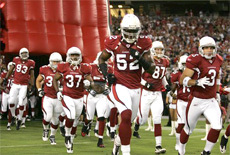 They ordered eight swivel casters and eight rigid, dual-pneumatic casters to roll out enormous speakers during pre-game and halftime shows at the University of Phoenix Stadium. Both casters are well suited to the stadium’s natural-grass playing surface, and they’re perfect for quickly hauling heavy objects. Check Your Inbox. Nab Your NFL Schedule. Keep an eye on your inbox for NFL schedules. If you haven’t received yours by Friday, September 9, call 800-733-7655; or email Steve.Lippert@hamiltoncaster.com. Haul Thousands of Chickens. No Back Strains. 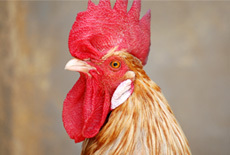 More than 30 percent of a large Midwest food processor’s workforce injuries were caused by 1,100-pound racks of chicken. The solution? Order Hamilton casters rather than visit the chiropractor. We recommended our Polylast wheels, which take less than 10 pounds of force to move. Prior to the switch, it took workers more than 50 pounds of force to lug fully loaded racks. That might not seem like a lot, but when employees haul hundreds of carts throughout the factory each day, the strain adds up. Cart caddies helped in long pulls by relieving some weight, but they didn’t reduce strains and over exertions within smaller rooms. The company tested our wheels against three competitors for three months and found ours to be the best solution. As a result, ergonomic injuries have dropped dramatically. The Big Number: Are You as Smooth as our HPI™ Raceways? 16: That's the smoothness in micro inches of the hardened raceways in our new Hamilton Precision Integrated (HPI™) swivel technology. The incredibly smooth surface swivels easily under heavy loads, and it outlasts conventional swivel raceways in 24/7 operations like automatic-guided vehicles and towline carts. In actual inches, 16 micro inches equals 1.6e-05e-05. 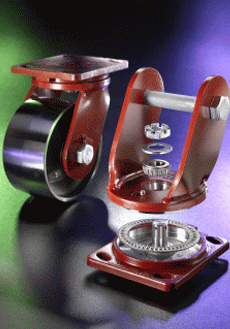 HPI swivel technology is available in our MD, MDD, EPSD, EHD, ES, and EHS caster series. They’re so smooth, you just need to touch them to believe it. From above, Apple’s proposed headquarters looks extraterrestrial. The manufacturer’s plans for a new facility call for a 1,615-foot wide mega structure that’s larger than the Empire State Building and the Pentagon. 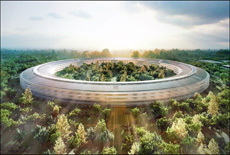 Dubbed “Apple Campus 2,” the company hopes to complete the Silicon Valley building by 2015. The four-story circular marvel is expected to house more than 12,000 employees and span 2.6 million square feet on 150 acres. Last June Apple presented its plans to the Cupertino City Council for approval. Although the complex hasn’t officially been given the green light, the Mayor Gilbert Wong said: “There is no chance that we're saying no. The Mothership has landed in Cupertino." Apple’s co-founder and former CEO Steve Jobs said the new campus is necessary because of the company’s rapid growth. One of the main draws to Apple’s new HQ is green space. By moving parking underground, 6,000 trees will dominate the landscape in and around the building. 1. Capacity: How much weight will the caster bear? Higher capacity requires forged steel while lower capacity uses cold forgings. 2. Type: Does the wheel need to rotate 360°? You’ll need a swivel caster. For straight-line operation, choose a rigid caster. There are other options like brakes, swivel locks, seals and more. 3. Constraints: Do we need to match a certain top-plate size or envelope where the caster will be mounted? Does overall height matter? 4. Environment: Often overlooked, but extremely important. Will there will be moisture, high heat, chemical exposure or rough floor conditions? Is noise a concern? 5. Operation: How will it be moved? Manually or towed? Help us make a better recommendation. Call us at 800-733-7655 and we’ll recommend the best solution for your customer. We’ve all made New Years resolutions and broken them just as quickly. 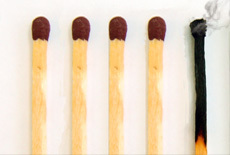 FranklinCovey’s “5 Choices to Extraordinary Productivity” world tour hopes to help change that. The tour hits 175 cities this fall, arming you with the tools to make the most important day-to-day decisions to finally obtain life’s most important outcomes. Check out the tour’s website for a list of the five choices and destinations. Design and Programming by: Ideopia, Inc.
© 2011 Hamilton Caster. All Rights Reserved.